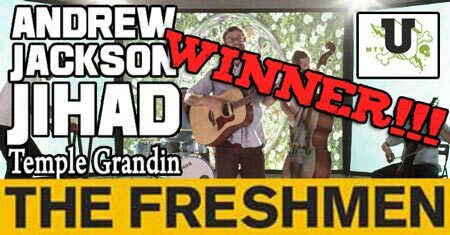 Andrew Jackson Jihad WIN The Freshmen! Triumph at HIP HQ today! We’re stoked to report that Andrew Jackson Jihad were successful in winning this week’s The Freshmen competition, which means they’ve secured a spot in regular rotation on mtvU for their killer video “Temple Grandin”! Thanks to each and everyone who voted.